¿Desea cambiar a la versión móvil de nuestra web? ¡Le recomendamos seguir en nuestra web móvil! ¡Cambiar a web móvil sin identificarse! Libro THE BIBLE OF KARATE - BUBISHI, traducida al inglés con comentarios de Patrick McCARTHY, 15 x 23 cm, 255 páginas, inglés. "La biblia del Karate". Treasured for centuries by karate's top masters The Bubishi is a classical Chinese work on philosophy, strategy, medicine, and technique as they relate to the martial arts. Referred to as "The Bible for Karate", for hundreds of years it was a secret text passed from master to student in China and later in Okinawa. All of karate's legendary masters have studied it, applied its teachings, or plagiarized from it. 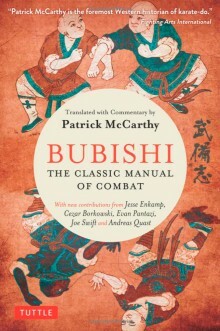 No other classic work has had as dramatic an impact on the shaping and development of karate as The Bubishi.